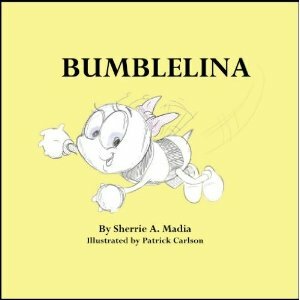 Bumblelina by Sherrie A. Madia, Ph.D. and illustrated by Patrick Carlson is a simple story about a little, preschool bee. She is small and can’t fly like her peers, but she doesn’t give up. Eventually a gust of wind helps her out, and she learns to flap her wings. Her friends celebrate her success. “My youngest daughter, Anna, once told me she would ‘speak in big words so I would understand,’ which both made me laugh, and really hit home. While I’d like to think I’m pretty good at communicating, I sometimes forget that when I’m not writing textbooks, I don’t need to talk like one!” says Dr. Madia. So why write a series of books for children? “This book teaches children the timeless lesson of trying—about the importance of perseverance,” says Madia. “If you work hard at something and don’t give up, you can achieve your goal. In our instant-message society, teaching patience and hard work is more important than ever before,” adds Madia. I do like the simplicity of the book, as too often children’s books are overdone and odd in both text and illustration as a result. It is a simple sweet story, but I think something may be missing to truly get the message of perseverance across. A few more trial and errors, perhaps, would make the story stronger. Would I buy this book? Maybe. There isn’t anything eco-friendly about it, unfortunately.